The MIC95410 is a high-side load switch for computing and ultra-dense embedded computing boards where high-current low-voltage rails from sub-1V to 5.5V have to be sectioned. The integrated 6.6mΩ RDS(ON) N-channel MOSFET ensures low voltage drop and low power dissipation while delivering up to 7A of load current. 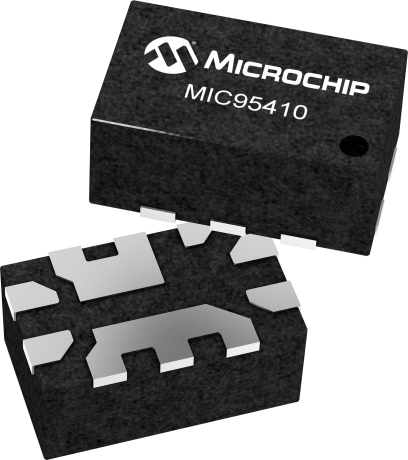 The MIC95410 is internally powered by a separated bias voltage from 2.7V to 9V. It includes a TTL-logic level to gate a voltage translator driving a charge pump, and an output discharge function when disabled. The OFF-state current from bias supply (VS) and the power switch OFF-state leakage current (IOFF) are both below 1μA. The MIC95410 provides user-adjustable slew-rate-controlled turn-on to limit the inrush current to the input supply voltage. The MIC95410 is available in a thermally efficient, space-saving 10-pin 1.2mm x 2.0mm QFN package with 0.5mm pin pitch and an operating junction temperature range from –40°C to +125°C. The MIC95410 is a high-side load switch used for computing and for ultra-dense embedded computing boards where high-current, low-voltage rails from sub-1V to 5.5V have to be sectioned. The integrated 6.6mΩ RDS(ON) N-channel MOSFET ensures low voltage drop and low power dissipation while delivering up to 7A of load current.